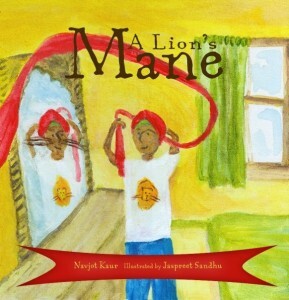 A Lion’s Mane is about the journey of a young Sikh boy who while discovering why he has his long mane (kesh), also learns about the principles of his faith. Concepts like patience, generosity, wisdom, and courage are all woven in to his beautiful red dastaar that guide you through the story. Although I have read several children’s books that touch on the Sikh experience, what I appreciate most about A Lion’s Mane, is how Sikh religious and cultural principles are raised in the context of other cultures and communities with similar principles. I had no idea of the symbolic role the lion played in Native American Hopi culture. In explaining who we are to non-Sikh communities, I think it is just as important to share how our traditions are similar as it is to show how we are different. This pushed me to learn a bit more about some of the other people and cultures mentioned. I found the glossary most useful in explaining to my children who is Wangari Mathai and what the Anishinaabe tribe is. A Lion’s Mane has become quite popular in our sangat circle, not only for being an excellent resource for inspiring children – Sikh and non-Sikh alike – but also for Saffron Press’s commitment to being environmentally responsible (printing their books on 100% recycled paper) and socially conscious, donating a portion of their proceeds to restore sight and prevent blindness in children. The image on the front cover of the book shows a young boy tying his dastaar in a mirror. But as he peers at his reflection, he seems himself with the whiskers of a lion, symbolizing its strength, courage and bravery. So many children struggle with their self-image and identity. And with our distinct uniform, many Sikh children find it even more challenging. I believe any book or initiative that helps promote a positive self-image and confidence in one’s identity should be both supported and celebrated. I look forward to further publications from Navjot Kaur, and would encourage her to consider a sequel depicting the journey of a Sikh girl. Although the path of Sikhi is the same, I’m sure the experience is different. And there are few, if any, children’s books I’m aware of with a young Sikh girl as the main character. A Lion’s Mane is definitely a hit with our kids! Truly a wonderful book…a must read! “Everybody can be great…because anybody can serve. You don’t have to have a college degree to serve. You don’t have to make your subject and verb agree to serve. You only need a heart full of grace. A soul generated by love.” – Dr. Martin Luther King Jr.
Last week, in celebration of Dr. King’s legacy, the DC Metro satellite of Kid’s Against Hunger drew volunteers all across the DC, Maryland, and Virginia area for a hugely successful meal packaging event. Kid’s Against Hunger (KAH) is a non-profit organization with the mission to significantly reduce the number of hungry children in the United States and to feed starving children throughout the world. This is accomplished through partnering with satellite organizations who raise funds, organize volunteers, and arrange events where meal packets (consisting of soy, rice, vegetable blend, and flavored vitamin powder) are filled, sealed, and packed for a population in need. Meals are then transported through KAH’s broad network of humanitarian organizations. I came to learn about KAH, as the DC Metro satellite was founded by a group of young Sikh professionals in the DC area only six months ago. One of the founders, Romi Bhatia, a professor at George Washington University’s School of Business with a background in microfinance, learned about KAH from a report on The News Hour with Jim Lehrer back in August 2009. “It was the simplicity of it all that initially appealed to me”, Bhatia said, describing the packaging events where volunteers meet in a central location to package nutritious meals for an underserved population. “We wanted to create an avenue where the work of local volunteers, who are willing to spare a few hours, can have far-reaching impact globally.” Shortly after watching the news report, Bhatia called the KAH headquarters in New Hope, MN and was surprised to learn that of the 70 satellite locations, the DC Metro area was not one of them. By September 2009, Bhatia and others gathered a handful of like-minded people to discuss the idea. Two months later, after raising their initial funds and establishing their non-profit organization status, they held their first packaging event – recruiting over 30 volunteers and packaging 9,500 meals. Three months later for their second packaging event on Dr. King’s Day of Service, they set a goal to package 18,500 meals. However, through the flurry of facebook invites and the announcement that all packaged meals would be sent to the recently earthquake-stricken Haiti, the number of volunteers tripled, topping 100 – in which 21,750 meals were packaged. It even received coverage from the local media [see below]. “It was amazing to see such a huge turnout and so many people come together for a common goal“, said Veena Chawla, a KAH-DC Metro board member and physician at a local primary care clinic. “We have to realize that it doesn’t really take a lot of money or even a lot of effort to make a difference in someone’s life”, said Chawla. I must admit, last week’s event was one of the few times I’ve seen dozens of volunteers from all races, religions, and backgrounds all diligently volunteering for an initiative that was founded and managed by Sikhs. Bhatia, however, feels this is very much in line with their satellite’s mission. “Although the board is currently made up of Sikhs, and many of our personal reasons for doing this stem from our Sikhi roots, our goal is to bring people together of different races, ages, and ethnicities to package and distribute meal packets. We are very pleased to see the diversity in our volunteers, and plan for our board to eventually reflect that diversity too,” said Bhatia. Following the work of the KAH-DC Metro satellite since its inception, it’s remarkable how quickly they moved from a handful of people discussing a concept in a living room to producing actual results, assisting people in need. Part of their success is due to the model they chose. Rather than “re-inventing the wheel”, they partnered with Kids Against Hunger to take advantage of its established infrastructure, yet they also created their own non-profit organization, where they have the flexibility to make independent decisions on their goals and even where they send the meals. More so than that, I believe it has to do with having a solid vision and a focused objective – in other words…focus on the work…and let the organization slowly build itself around it. The KAH-DC Metro team set a goal to raise enough funds and organize enough events to package 50,000 meals in their first 12 months. They are well on their way of accomplishing that goal and perhaps surpassing it. Congratulations to KAH-DC Metro for a successful launch! I look forward to hearing more about their achievements in the future.